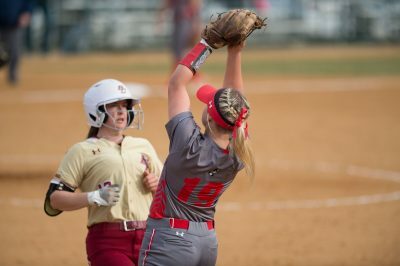 The Boston University softball team opened its season in South Carolina this weekend with a five-game set in the Kickin’ Chicken Classic. The Terriers opened up the weekend Friday morning against University of Illinois at Chicago. The Terriers took an early lead in the top of the second when freshman pitcher Emily Gant led off the inning with a double to the gap in left-center. With Gant on second, freshman Bella Gargicevich-Almeida dropped a sacrifice bunt that was misplayed, resulting in a run for the Terriers. Illinois-Chicago would come back to gain the lead in the bottom of the third inning after a walk, a single plus throwing error and then a fielder’s choice to tie the game at one. The Flames would then take the lead after a fielder’s choice and a single, making the score 2-1. In the top of the fifth, the Terriers clawed back to take the lead, 3-2, off of an RBI single by senior infielder Emily Morrow and a bases-loaded walk by senior catcher Alex Heinen. The Flames’ pitcher, Allie Trudeau, saved a run at the plate with a force out. The Flames would tie the game up in the bottom of the sixth after consecutive sacrifice bunts with runners on first and second. Then heading into the bottom of the seventh, the Flames would have a batter reach first off a throwing error, a steal of second and then a walk-off single to win the game 4-3. Sophomore pitcher Ali DuBois pitched five innings, giving up one earned run to go with four strikeouts. Gant would take the loss after 1.2 innings pitched and two strikeouts, but the walk-off run was unearned. For the Flames, Trudeau pitched a complete game with three strikeouts and one earned run. The Terriers would bounce back from a tough loss for a run-rule victory Friday afternoon, as the BU offense pounded Rider University for eight runs. The Terriers jumped out to a lead early in the bottom of the first as Heinen used heads-up baserunning to score from second base off a single from senior infielder Madi Killebrew. In the bottom of the second inning, the Terriers would score three runs off of a two-run single from freshman outfielder Aliyah Huerta-Leipner and then an RBI single from Morrow to make the score 4-0. BU finally blew the game open in the bottom of the fourth with a five-hit, four-run inning. Morrow added another RBI single, followed by a two-run knock by Heinen and then an RBI groundout by senior catcher Alexa Ponce to close the scoring 8-0. Gant pitched a shutout, giving up only one hit in her five innings of work, including three strikeouts, and faced only two more batters than the minimum. Saturday was a long day for the Terrier offense, as the team was shutout by both Coastal Carolina University and No. 8 ranked Tennessee. The Terriers committed five errors against the Chanticleers, leading to only two of the six runs being earned. Freshman pitcher Julia Handfield took the loss, throwing 1.2 innings. DuBois came in for relief and threw 3.2 innings and junior pitcher Kali Magane closed out the game with .2 of an inning. BU was held to five hits and Chanticleer pitcher Ashley Guillette struck out six Terriers in a complete-game shutout. Chanticleer center fielder Courtney Dean did the heavy lifting on offense for CCU, as she went 3-for-4 with a homerun and a double with four RBIs. The Terriers cleaned up the defense in this game, only committing two errors in the loss. Tennessee jumped out to an early 2-0 lead in the first inning with a two-out rally after a walk and consecutive singles. The Volunteers would strike again in the top of the second after a sacrifice fly, making the score 3-0. The eighth-ranked team in the nation would then top off the scoring in the seventh inning with an RBI groundout. Gant would take the loss after putting in three innings of work, giving up four hits and two earned runs. DuBois finished the final four frames with four strikeouts and no earned runs. Volunteer pitcher Ashley Rogers twirled a gem on the mound pitching a complete game shutout with a staggering 13 strikeouts, never allowing a runner to advance to second base. In the final game of the Kickin’ Chicken Classic Sunday, the Terriers had a rematch with Rider University. BU seemed to let out their pent-up offensive frustrations on the Broncs’ pitching staff, exploding for eight runs on 10 hits. Ponce started the scoring early in the top of the first, as she knocked a two-run double down the left field line to bring in Huerta-Leipner and Heinen. The Broncs would hold the Terriers in check until the fourth inning. In the fourth BU had three hits and scored four runs. Morrow knocked in a two-RBI single, forcing Rider to switch pitchers. The Broncs’ new pitcher was then greeted by back-to-back RBI singles from Heinen and Huerta-Leipner to make the score 6-0. Senior left fielder Analisa Ruff would add another RBI single in the fifth, and Heinen jacked a homerun in sixth inning to give BU an 8-0 lead. Rider would avoid being run ruled by scoring two runs in the bottom of the sixth off of two RBI singles. BU would close out the game against Rider 8-2 and leave South Carolina with two wins under their belt. DuBois picked up the win with four innings of shutout pitching, including five strikeouts and only one hit allowed. Junior pitcher Lizzie Annerino would pitch 1.1 innings, giving up two earned runs with two strikeouts. Handfield finished up the game by chipping in 1.2 innings worth of work with two strikeouts. Next on the schedule for the Terriers is the Upstate Classic, starting Feb. 15 with a five-game set against University of Connecticut, Bowling Green State University, University of South Carolina Upstate and Virginia Tech.